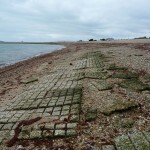 Hard G1 flexible concrete matting (Chocolate blocks) exposed at low tide in 2008. Hard G2 flexible concrete matting exposed during a storm in 2015. Concrete approach to Hard G3. 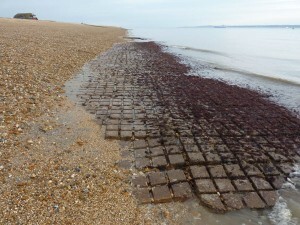 Some of the flexible concrete matting can just be seen in the shingle. 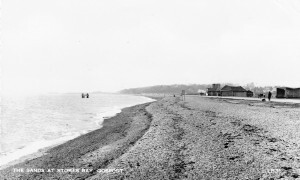 After the War Stokes Bay was handed back to Gosport Borough Council. Most of the equipment had been removed including the huts, tanks,shelters and storage facilities. 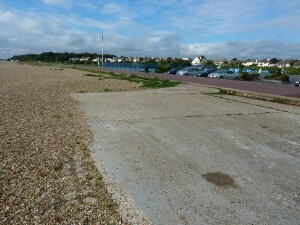 The approach roads and concrete mats to the hards were left. 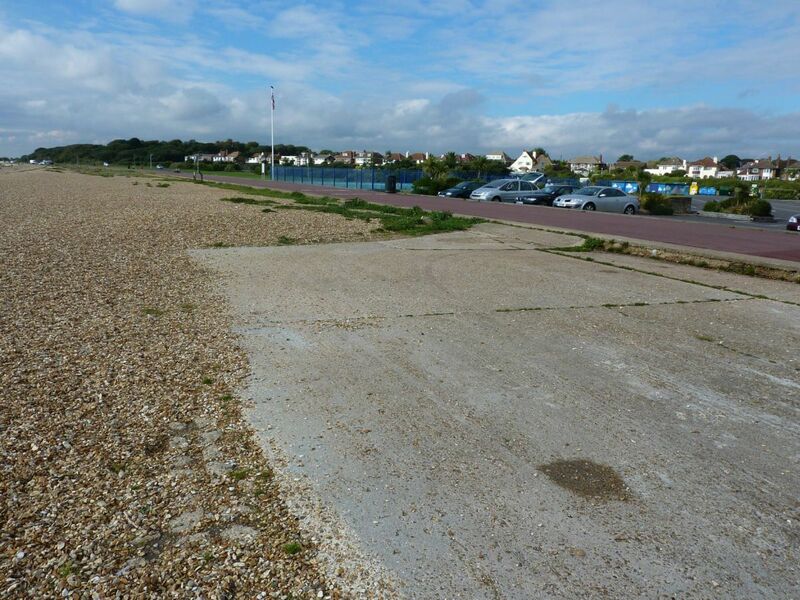 Gosport Council converted the ones at G1 and G2 to car parks. 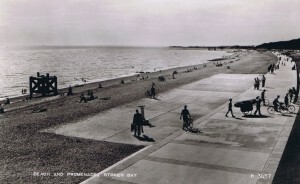 Areas of concrete for Hards G3 and G4 still remain alongside the promenade. 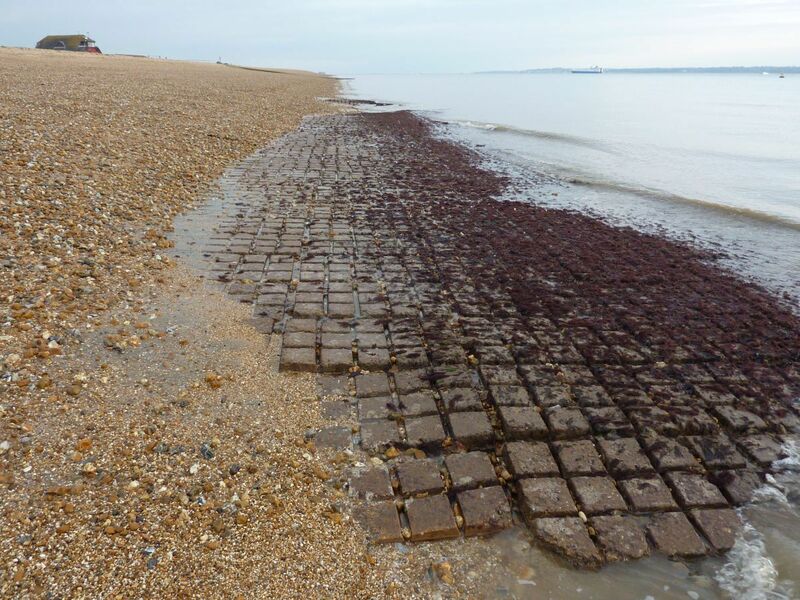 Some of the flexible concrete matting can still be seen at all four hards, when the tide and storm expose them. 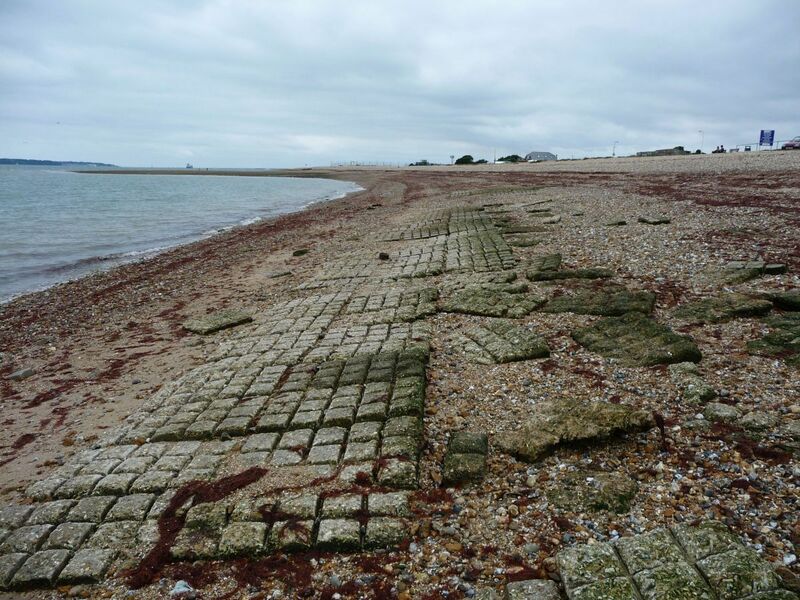 Most of the mooring dolphins also remained, but were demolished over a period of time. In April 1954 the minutes of Gosport Borough Council recorded that ’2 of the 3 WD dolphins at Stokes Bay are to be removed’. In May 1954 they had an offer to ‘cut off all dolphins at east and west ends of Stokes Bay’. The last one to survive, as a diving platform for locals, was at Hard G3. 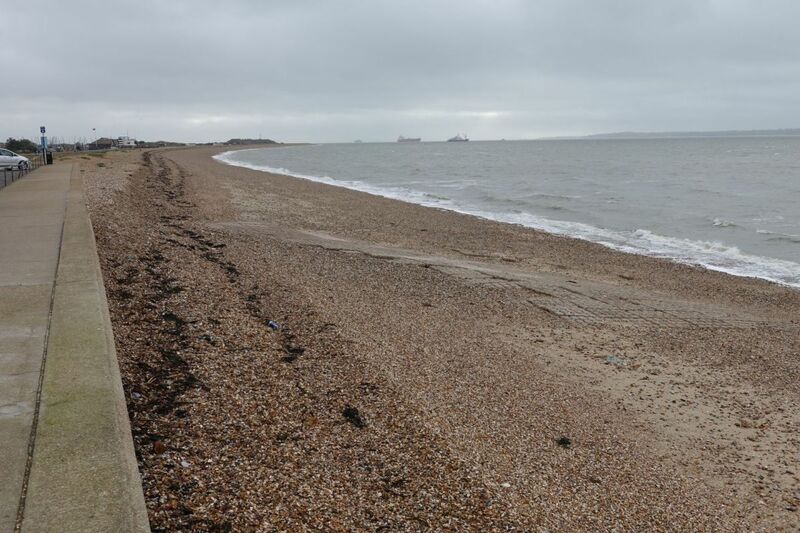 In 1982 Gosport Borough Council noted that it had accepted responsibility for this dolphin in 1972, and as it was suffering from underwater corrosion they decided to demolish it as soon as possible. It was removed shortly afterwards. A view from the top of the D Day Control Centre looking west over Hard G3. 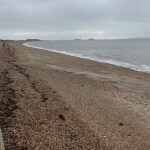 One of the mooring dolphins can be seen on the beach. 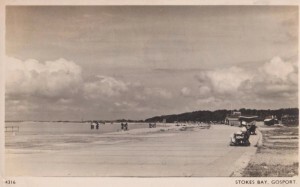 Stokes Bay Beach with three remaining dolphins at Hard G3, posted in 1956. 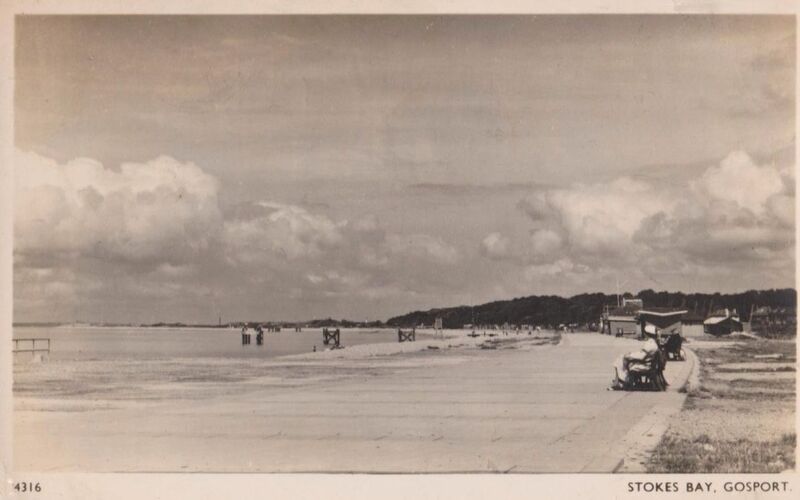 Stokes Bay beach taken between 1954 and 1956 with the last dolphin and the D Day Command centre before it was enlarged.